With the Webit Festival in Bulgaria this year, we wanted to take the opportunity to give PWN Sofia increased visibility – so we organized an event with PWN Global President, Sonya Richardson and Zornitsa Russinova, Deputy - Minister of Labour and Social Policy. During the day, Sonya took part in a panel debate at Webit on the topic of Women in Business and Technology. As you can see from the President’s welcome note to this quarter’s newsletter, Sonya is passionate about harnessing this important fourth industrial revolution and capitalizing on the digital era to level the playing field for aspiring women leaders. The panel was chaired by Rositsa Zaimova, a Bulgarian social entrepreneur who features in the Forbes 2018 30 under 30 list . Other panelists included a collection of senior women working in tech or industries where tech is having enormous impact. The evening of the Webit conference, PWN Sofia members and guests attended our event and took part in inspiring conversations with Sonya, covering the topics of gender balanced leadership, work-life balance and women’s career development. Also at the event, Zornitsa Russinova spoke about Bulgaria’s achievements and challenges in supporting gender-balanced leadership. 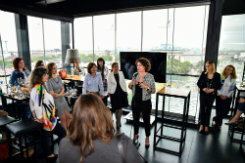 In a relaxing atmosphere, complimented by a breathtaking panoramic view from the famous Sense Hotel Roof Top Bar, members and guests of PWN Sofia enjoyed a networking session, sharing their experiences. Founded in November 2017, PWN Sofia is the 30th city network within PWN Global, and a very young and dynamic association. This team brings together members, women and men, leaders and entrepreneurs, individuals who understand, embrace and support the mission for gender balanced leadership in society and business. There is a strong female leadership tradition in Bulgaria, with 38% of the managers being women versus 33% EU average (source Eurostat). The country has some leading ladies in power, also a potential pool of future women leaders in middle management, which provides a good potential to achieve the EU directive of 40% women board members in boards of public companies. The country seems to be well positioned in terms of gender balance versus the EU average indicators, since it has no mandatory quotas as in most EU members. There is still a lot to do in order to get closer to the EU targets, and to increase the social awareness on the importance of the cause. PWN Sofia has committed to these targets and we believe that together, we can help our members and local businesses build long-term strategies and partnerships that will support us in the journey to make balanced leadership our new reality.